On a boat tour, the reflections of the landscape around Western Brook Pond in Newfoundland, Canada are clearly visible in the window. The sun shines over the Western Brook Pond in Gros Morne National Park in Newfoundland Labrador, Canada for the passengers aboard a boat tour. As the sun reflects off the window of the boat, beautiful reflections of the landscape can be seen in the wheelhouse window of the boat. 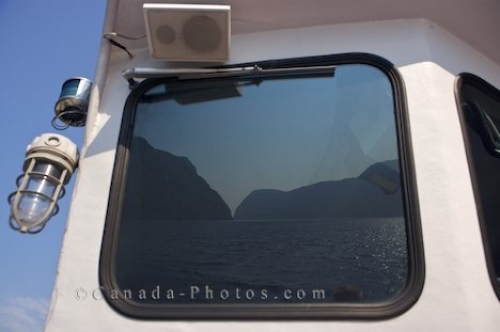 Reflections in the windows of a tour boat in Western Brook Pond, Gros Morne National Park, UNESCO World Heritage Site, Viking Trail, Trails to the Vikings, Highway 430, Northern Peninsula, Great Northern Peninsula, Newfoundland Labrador, Newfoundland, Canada. Picture of the landscape reflections of the Western Brook Pond in Newfoundland, Canada in the tour boat's window.